Our trip to the Las Vegas area had been primarily to pay a visit to Valley of Fire State Park, about an hour east of town. None of us had been to this area, purported to have fantastic sandstone scrambling and picturesque scenery. We would not be disappointed. Most of the summits we climbed were purloined from Purcell's Rambles & Scrambles and made for good scrambles as promised. Interestingly, the two not found in his guidebook were the best of the day, I thought, short but exceedingly good. I had picked out the 4-starred summits from Purcell's guidebook to give us the best the place had to offer. First on our stops was Five Arch, the easternmost of the peaks, less than a mile north of SR40, the main road through the park. No one was manning the entrance booth when we drove in, so we stopped at the self-pay station to pay the $10/vehicle fee. I get the strong impression that no one actually checks to see if you've paid during your visit inside the park, just upon entering or exiting if the booth is manned. 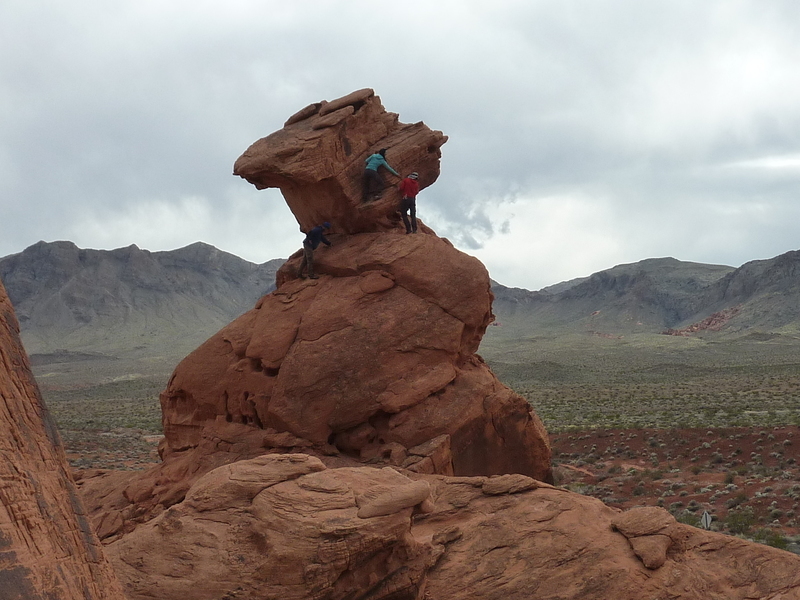 We parked just west of the John Clark Memorial Monument, near a service yard in poor condition and hiked up a wash and along some mud ridges to the base of our peak on its south side. From there we scrambled up a class 2 talus gully and made our way around to the north side where our guidebook said we would find a set of five arches and the key to the route up. Try as we might, we found no arches on the north side of the summit, or at least nothing that any of us would describe as an arch. After some time looking around and a bit of frustration, I went up the only plausible-looking route, a short bit of class 4 that eventually led to the top, with some features described in the book identifiable. No one was quick to follow me, so after finding my way to the summit rather easily (the crux was the only tricky part), I descended a slight alternative down through a keyhole (I was exploring to see if there was a way off the east side, but nothing doing there), eventually circled back to the crux. Scott had just come up, and after I descended the crux the others went up in turn, on to the summit and back. No register found aloft and none left. A good but not great scramble, and much too short. We returned back around the west side of the formation just for a change of pace, eventually returning via the same wash we had ascended in beginning. This next one was better because it had a good deal more scrambling. We didn't follow the route Purcell describes starting from Mouses Tank because that seemed unnecessarily long and convoluted. Instead, we approached from the south, about one and quarter mile each way - half the distance of the Purcell route, again parking along SR40 again. We followed another wash heading north, going over a low saddle and dropping into the wash connecting with Purcell's route. Again, we had trouble identifying his descriptions. We found no "crimson stairway" just as we had been unable to identify the five arches, and little else in the long description seemed to fit anything around us. We didn't spend much time looking for the expected and simply made up our own route. It was a little tricky but we managed it in fine style and enjoyed the scrambling very much - this one was worth all four stars. On the return I led us down an alternate route near the bottom in hopes we might yet find the ellusive stairway, but alas, no such luck. We did find some cool caves tunnels formed by chockstones that had Iris and I squealing like the excited kids we were. We liked this one very much, thank you. This a neat little picnic area off the south side of the main paved road going through the park. There are seven rock formations that rise from the desert floor, detached from the main hills on the north side of the road. Confident in our scrambling abilities, we jumped out of our vehicles and walked over to what we guessed were the highest ones and quickly had our egos deflated. These were serious endeavors that were not going to give up their summits easily, perhaps not at all. We saw no sign of hangers or other climbing activity and wondered aloud if climbing was even allowed here. There were no signs indicating one way or the other, but it didn't really matter since we didn't have any serious rock climbing gear with us. Of the seven formations, only the one closest to where we parked the cars looked like it would be within our abilities. Not convinced that even this one was doable, the others let me climb up about halfway before Scott and Iris decided to follow. It was a tricky bit of scrambling that falls into what I would call class 3-4 - not overly technical but very exposed. I was up and down before the last of our party had reached the summit because I wanted to get a few photos of them on the pinnacle to show the route. A very worthwhile stop, this one, and not in Purcell's book. This was the second stop we made not described by Purcell. It is located just west of the Visitor Center, right off the road, and one can't help but draw attention while attempting this. The large cube-ish rock balanced on a pedestal looks to be overhanging on all sides and not accessible to the unroped scrambler. Scott and Iris discovered the backside (north side) has a weakness that can be surmounted, though in the low class 5 range. I went up and down this one first again, finding it pretty darn close to what I would be (un)comfortable soloing. The crux is a two-step process to get up the summit weakness - a first step onto a downward-sloping platform followed by a beefy haul up onto the block above. Scott and Iris did this in good style, both having far better reach and flexibility than myself. Tom decided not to try it, so the two of us wandered about the base while the other three gave it a go. Matt was the last one to give it a try, his words and actions in the attempt making the rest of us pretty nervous. Iris and Scott were with him at the crux point to offer advice and guide him through it. The downclimb was particularly nerve-wracking and Tom & I went back to the van to grab a rope and gear for a back-up plan to get him down via rappel. He managed to reverse the moves with some help from Scott, the rope & gear staying in the bag. I think it pretty safe to say it was the hardest thing Matt had soloed to date. We next headed north on the spur road going past the Visitor Center and the popular Mouse Tanks to a large parking lot between White Domes to the west and Gibralter Rock to the east. For some reason I thought this was going to be an easy 15min ascent, but somewhat confused it with another description in the guidebook. In fact, this one is quite tricky - Purcell says there are at least 3 class 4 routes to the summit and it seems we would find two of them. Once again feeling supremely confident, we nearly tripped over ourselves running out of the cars and over to the west side of the formation. Any hope for a quick ascent from that side soon evaporated as all looked hopeless. Our merry band then virtually disintegrated as we chose various alternatives to explore. Tom and I went up one gully, Scott ran around to the north side to attack it from there, Iris and Matt getting lost in the shuffle. Seems Iris ran into a cactus and needed to spend a few minutes extracting it from here ankle. The narrow gully Tom and I went up had a ramp allowing us to escape to the east from the walls closing in on us. Above, I ran into Scott who had found another way up from the north. But we were still not at the highpoint which was further to the southwest with a cliff face presenting itself wherever we looked. We checked several options, only one of which seemed doable, but highly exposed on crappy rock and looking much harder than what Purcell would normally describe as class 4. I backed off as Scott and Tom looked on. Scott then joined me for more searching further south, eventually finding our way down a class 3-4 chute to the ground below without finding a way to the highpoint. Tom (and now Iris and Matt who'd caught up with him) waited about 15min before deciding Scott and I weren't coming back. Seems we had a bit of a miscommunication there. Ooops. Perplexed, Scott and I returned to the west side, having nearly circumnavigated the highpoint with no idea how to get up it. We had returned to the park trail with plans to go back to the cars and wait for the others when I spotted a very large cairn at the top of a talus and rock fan on the west side. Excited, we both ran off to investigate. The cairn marked the start of a very steep crack/gully that we had dismissed initially as impossible, but once around the corner to investigate up-close, it proved to be the key. A very cool route through chockstones and other fun led up to the summit in about 10min - seems there was a 15min route afterall! With cell service at the summit, we attempted to call our compadres to help guide them to the cairn. No answer. Somewhat deflated but happy with our own success, we descended back down and returned to the TH in another 15min. As we neared the cars, we heard shouting behind us and turned to see our other three friends waving at us from the summit. This also caught the attention of the dozens of other visitors plying the trails in the area and it created somewhat of a scene. Scott finally managed to get one of them on the phone to understand how they'd managed to get up there without us seeing them. Seems they had found one of the other class 4 route on the east side and had gotten up shortly after we'd descended. Rather than try to explain to them how to find the west side route for the descent, we let them go back the way they came and about 30min later we were all back at the cars - great fun, this one. Matt was planning to head back before we did any more scrambling, so we drove back to the Mouse's Tank picnic area to give him the opportunity to BBQ for us one last time (so very kind of us, I know) before he headed home. It was quite a feast that would send Tom and I into a meat coma due to the excessive consumption of delectable treats. Seems Matt was BBQing for five but only three of us were eating - Scott and Iris decided to go off and climb nearby Cairned Peak, instead. I wasn't exactly complaining, mind you, but there was little doubt that I had over-consumed, probably enough meat to satisfy me for a week under normal circumstances. After Scott and Iris had successfully reached the summit and returned, we all said goodbye to Matt and then head north for a last bit of scrambling before we'd run out of daylight. The Orphan is found northwest of the road's end at the White Domes TH. We parked at the far north end of the lot there and headed off for what seemed easily doable with the remaining daylight, the distance less than 1/2mi. All that we could glean from the guidebook was that there was likely only one route to the summit from the northeast aspect. We made our way to what we thought was the northeast side and up some fine scrambling in about 30min, only to find ourselves separated from the summit by what looked like two large chasms and a whole lot more scrambling than we had bargained for. We decided it was better approached from a different direction and turned back. In hindsight (from a successful attempt the next day), we were unwittingly already on the right track and probably only 20min away from the summit had we continued. It was just as well, because when we returned to the TH, we could hear a ranger over a bullhorn warning all the remaining visitors that the TH was closing in a few minutes (closes at sunset) and any cars still there would be ticketed. So we saved ourselves a ticket by returning - a good call.